Prolific composer Dennis Kamakahi and the multi-talented Stephen Inglis kicked off the 29th season of EKK with “Waimaka Helelei” concert, celebrating songs of Kalaupapa on Molokai. A serious topic about a unique place in Hawai’i with its own history was skillfully and sensitively presented with archival images, heart-wrenching stories, new and old songs by two exceptional musicians. The children of Ke Kula Niihau o Kekaha, led by Love Kelly, opened the program with the beautiful songs of Niihau. It was a treat! SSSSSSSST — Spontaneous, Serendipitous, Stellar performances Sensuously full of Storytelling and Sizzling Singing Styles…. Sometimes, when you trust your intuition and good luck kicks in, you end up with a match made in heaven. Such was the case when we invited two artists who never performed together before – Brother Noland and Diana Aki. Early on, I checked with Noland, “Do you think you can play with Diana Aki?” “I can play with anybody!’ came his confident and reassuring reply. Sure enough! If you want local style, kolohe, and talent oozing out of their pores, that is what you got on the opening night of EKK 2012. Noland – fully animated, shocking white pony tail, huge expressive eyes, a seasoned performer who demonstrates a wide range of musical styles but definitely a recognizable way of “Nolanizing” songs with his finger-snapping Jawaiian beat and Sachmo growl. Diana, sporting a new younger coif of wavy gray hair, appears reserved until you put her on stage; she comes alive and sparkles with stories of old and a voice that fills the rafters, not only with traditional Hawaiian mele in the style of her idol, Aunty Genoa Keawe, but contemporary songs by Stevie Wonder and others. The Songbird of Miloli’I delivers her songs with the sweet smoothness of warm maple syrup in melted butter. Growing up with his hanae family on the green pastures of cowboy country Kamuela, Noland’s mom called him to take a test in 1964 which he passed. 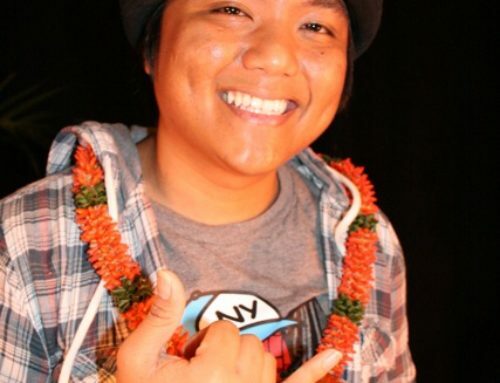 It changed his life style drastically as he had to cut his hair, wear shirt and shoes and get his schooling up on the mountains of Kalihi in a gated community called Kamehameha Schools. Living on Pua Lane in Mayor Wrights “estates” led him to composing one of his well known songs – Pua Lane (Poor Lane) — to which he bid adieu in his song. Even as a youngster he composed his own songs but would not admit it openly as writing poetry while playing football was not considered too cool. Gaining reputation as the “rockajamma” guy, he became more open about his poetry. Although his songs have a blues, jazz or reggae beat, many of his songs are influenced by his early lifestyle with his Hawaiian tutu who taught him to swim or sink and fishermen who taught him to fish. 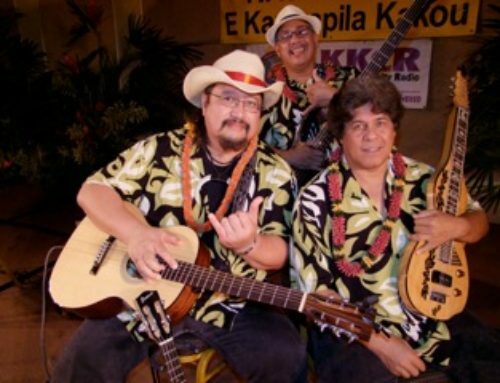 Great Hawaiian Man was one of the soulful songs that came out of spending quality time with his younger brother kumu hula Tony Conjugacion. Of course no Noland performance would be complete without the interactive singing of Coconut Girl, the song about the high fashion girl which Noland claims help him put his three kids through college. Noland asked Diana if she knew Coconut Girl (she later admitted she was wracking her brains trying to figure out the song); Noland let her off the hook by saying, “Well, if you live in the ‘nation of Miloli’i’, you probably never heard of Coconut Girl. A nomadic artist, he moves easily from one gig to another but one of the recent gigs that made a huge impact on him and others on the tour was to the visit to the tsunami-devastated region of Japan where they observed first-hand the short-term and long-term damage to those directly affected by the devastation. He later shared videos on his I-phone and stories of how the visit impacted everyone in the good-will tour. When her birth parents could not raise the 14 siblings, they were hanae’ed to a Hilo couple – one parent was Hawaiian-Pake and the other was Norwegian-Hawaiian. At that time, they could attend school from only kindergarten to 4th grade. She spent most of her time among kupunas because her two aunts were always singing and partying, and the resulting master-servant relationship was fine with her. One day they finally accepted that Diana had learned the kupuna way of thinking. From them she learned a rascal song Down the Suse about an old violin-playing man from Miloli’i who came home and could not find his wife. The old man shrugged and said that he would leave his wife before she left him and went on his merry way playing his violin. In the remote fishing village of Miloli’i there was only one slack-key player left. Diana decided, “ I want to learn how to play slack key so I can accompany myself.” Tutu told her, “No need to do that; that’s not for you. Pay attention to the meaning of the song you’re singing and everyone will surround you and they will bring their special way of playing to you.” Pointing to Noland accompanying her, she acknowledged tutu’s wisdom. As remote as Miloli’i was and still is with no water and no electricity, one day the radio came to town and everyone quickly forgot about Hawaiian music as outside music was now accessible. Lately and Someone to Me were songs she embraced as much as Hawaiian songs. But it was in the scale hopping Hawaiian mele that one gets the full impact of her range, songs like Aloha Punalu’u, Kalena Kai, Nani Wale, Songbird of Miloli’I and Mana’o Pili. In the 1970’s she was asked to tour with Eddie Kamae and the Sons of Hawai’i. It was a great honor for her. When on Kaua’i she stayed with the Wong family in Koloa; she found their hospitality so special that on the airplane flying back to Hilo, she composed a song, Mana’o Pili about the special experience on Kaua’i. This song won her several Na Hoku awards including “Female Vocalist of the Year”. Being the first neighbor island person to receive this award, the whole village of Miloli’I made a big luau for her. She joked that now she was “somebody” in Miloli’i. Mana’o Pili will be performed by Leina’ala Pavao Jardin’s halau this year. After an all too brief stint island hopping with the Sons of Hawai’I, she came to a crossroads in her life. Be a mother to her seven sons and two adopted daughters or continue to be the Songbird of Miloli’i. The maternal instinct took priority and she put her musical career on hold. 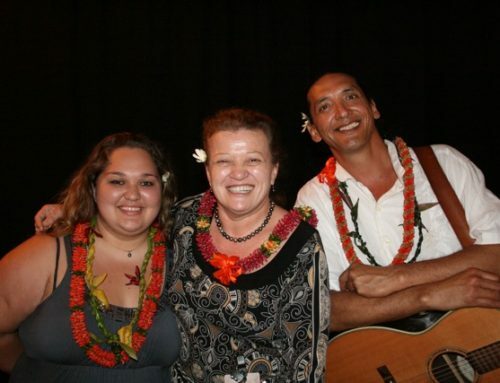 Finally, after raising her family, working as tour bus guide, and teaching children as a kupuna in Honaunau, she is finally returning to her love of music and picking up the pieces as a singer. It looks like we will be seeing a lot of Diana Aki from now on. Noland jump-started the second half with his “Nolanized” version of Keola Beamer’s Mr. San Cho Lee which pokes fun at characteristic ethnic quirkiness of local folks in Hawai’i. It was embellished with sound effects, musical accompaniments, and more body languages. As Noland pointed out, it may seem like we are making fun of each other, but in essence it is the Aloha way that friends and neighbors of different ethnicities get along with each other. Vern Kauanui, as always, could not be kept off the stage as he thrilled the audience with his graceful moves to several hula including a noho hula to Pupu Hinu Hinu, one of the two songs that Noland taught the audience. We also got to learn ’Ua Mau a song that was sung by the children of Niihau at the opening night concert. As part of every Monday, the artists teach a song or two to the audience both in ‘ukulele circle and with the entire group. One can appreciate the simple beauty of the Hawaiian language in song when 350 or more voices sing it together. What a rush! Audience members shout out requests and the singers obliged with their spontaneous never-rehearsed-before harmony of Hi’ilawe on the beautiful Hawai’i island, home of both Noland and Diana. What a choice song to end a wonderful program. So true! When you watch everyone holding hands and raising their voices with smiles on their faces, tears streaming down their cheeks, you know you have a new EKK fan. It’s moments like this that live on in the memories of those who are for the first time witnessing the gift of making aloha so tangible … and they are forever held hostage to the beauty that is Hawai’i. And for those who were just pretending they knew the words and melody, Keith Haugen will be teaching the proper way of singing Hawai’i Aloha during ‘ukulele hour on Monday, Feb 6.
with KFC finger-lickin’ great music! 6:00 – 7:00 ‘ukulele hour: You get to learn to sing and play Hawaii’s two most sung “musical anthems” from Keith; you get to learn the hula “Puamana” from Carmen; you get to learn the mysteries of playing actual notes on the five-gallon bucket “pakini” from the inimitable Frank Uehara. COME EARLY! E Kanikapila Kakou 2012 Hawaiian Music Program is funded in part by the Hawai’i Tourism Authority, the County of Kaua’i Office of Economic Development, and the Garden Island Arts Council supporters with support from Kaua’i Beach Resort.